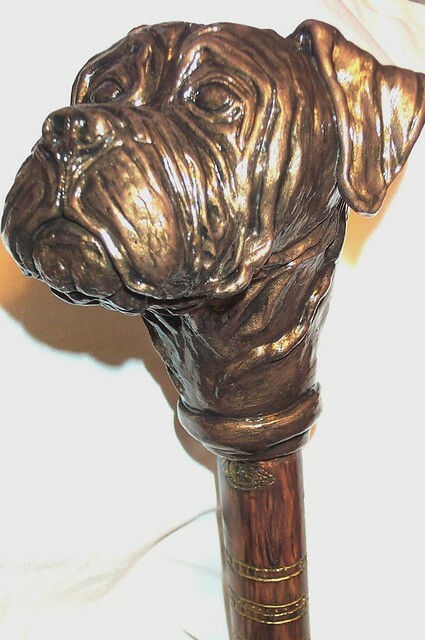 Breeding Better Dogs in Health, Temperament & Longevity run by a Licenced Veterinarian, Vet Tech & Canine Behaviorist where we care about the future of our breeds!!! All of our dogs are house dogs, I never saw much sense in having a dog you didn't live with-sure they take over (and take up) the entire house, but they are my life, the puppies (of course) are also raised in our home, they have a nursery that is temperature controlled, the walls are painted with bright colored murals to provide visual stimulation which increases brain function, and contrary to popular belief dogs do see in color the only difference is they can't distinguish between blues & greens but they most certainly see in color! The nursery also has a huge picture window that lets in lots & lots of sunshine; we also have full spectrum sun lamps to provide them with plenty of Vit. D (needed to process calcium properly) without it puppies would get what is called "swimmers disease" where they actually look like they are swimming because their legs cannot support them, of course a premium nutritious diet is essential, we add supplements of glucosamine & 3V-Caps (Amino Acids) for healthy skin, hair coat & general health, the glucosamine is needed for healthy growth of joints especially in giant breeds, and they get a daily chewable Pet Vite Plus multi vitamin & mineral tablet. The puppies are provided more toys than most human kids have, they also have hanging toys that they can tug on, and play with, they listen to a CD that has over 900 different sound effects on it, so these pups aren't going to be afraid of noises! Too many dogs are lost or worse during thunderstorms or fireworks, etc. 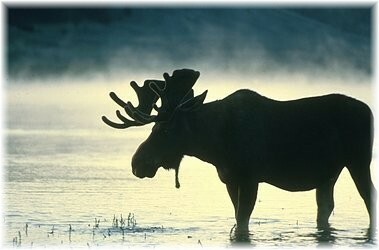 We have a veterinary practice so we see it all. All of this makes the puppies smarter, easier to train, they also learn to share so they do not turn into aggressive "guarders" of food or toys like puppies that were raised in wooden boxes with newspaper, or worse dirt. Their nursery is kept cleaner than a hospital nursery, we use clean pine shavings that are changed & cleaned constantly. The puppies are bathed daily with baby wipes with Shea butter. They are fed a mixture of moistened Iams large breed puppy formula & Purina Pro Plan Large Breed Puppy Formula mixed with Pro Plan canned puppy & Iams canned puppy food. The pups are free fed from weaning so they are totally non-food aggressive, your toddler could stick their head in the bowl while they were eating & they could care less, a child could pull a bone out of one of my dog's mouths & they would just wag their tails, they could eat out of the same bowl without issue if their big fat heads would fit! <?xml:namespace prefix = v /> Our puppies are handled constantly, very well socialized with the rest of their family pack and humans, they get along great with smaller pets, dogs, cats, rabbits, one of my puppy people even has two pet rats that their bully gets along with just fine & he will share his food with the family cat! They naturally adore children and are great with them, very tolerant and mild tempered but if anyone ever tried to hurt their kids they would be very sorry! We are breeders who stand behind our puppies 100% and then some! I spend years researching pedigrees before buying a dog to breed with one of my girls to get the closest to perfect puppies possible, although almost all of my puppies are considered show quality I sell them primarily for pets because that's what I want, I want them to be family members, spoiled rotten and treated no different than a child! I put my heart & soul into raising these pups & get extremely attached to them and want to be sure they go to the best of the best homes! I also crate train the pups before they leave since that is when most people "give in" because they want the pups to like them or can't stand the fussing, so I make sure they are already used to the crates before they leave, no one would ever consider leaving an infant or toddler free in the house unattended and puppies are no different, it's even more dangerous for them since they chew things & we've seen way too many puppies die in the lobby of our clinic because they chewed through an electrical cord or ate some foreign object, or poison that could have easily been prevented by keeping them in a crate-I definitely do not condone keeping them crated all the time-ONLY when you are unable to watch them! Keeping them in a crate is NOT cruel, quite the opposite, it's the safest thing for them, plus these are denning animals, they like small enclosed spaces naturally & feel comfortable in them, this is their space just like a child's bedroom & should be left as their space with the door open (when you are able to watch them) so if things get to hectic for them they have a place to go to "get away from it all" for awhile, crate training is also by far the best way to "house break" your puppy since they will not soil the area that they sleep in, if they do then you are leaving them in the crate too long. Provide the pup with plenty of save chew toys throughout the first year because he/she will be teething for that length of time. Bullies grow fast but mature slow! 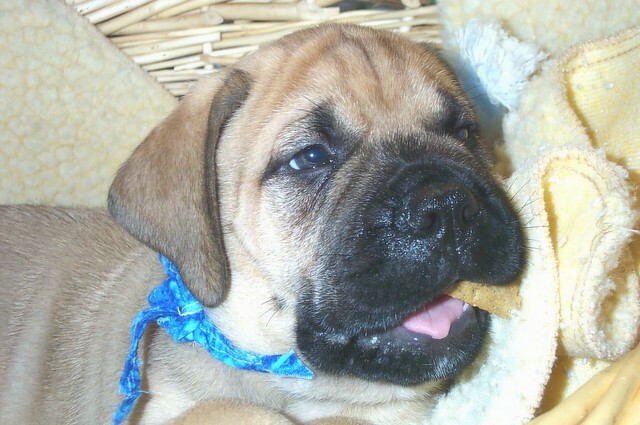 I will provide each of my puppy people with CD containing files on everything you ever wanted to know about raising a baby bullmastiff throughout adulthood and I am almost always available 24/7 to answer questions in regards to behavior, training, medical, or anything else-I've seen it all! 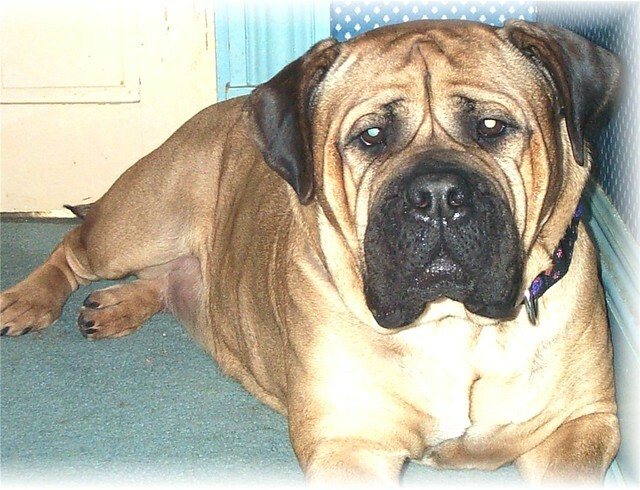 I am also more than happy to advise you in regard the best products that work well with Bullmastiffs & that are safe. You cannot bother me by asking questions & I'm definitely NOT one of those breeders who forgets you exist after the puppy is sold, I WANT to get pictures, hear stories, get updates about the puppy. 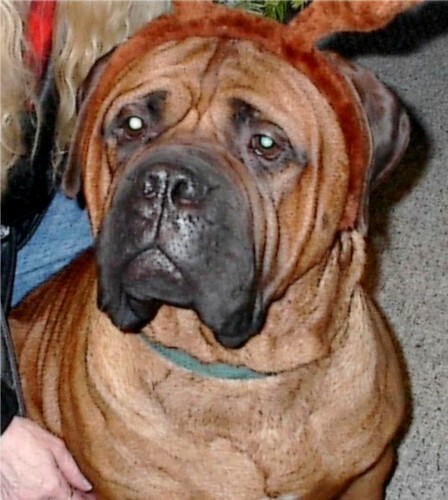 I've even started a group on msn for all of my puppy people to chat, share stories, and pictures of their bullmastiffs! deer in the fields & lots of wild turkeys! Brassau Lake not far from where we live-great Rainbow Trout! Canadian Geese chasing our bobbers! Some baby Wood Ducks ignoring their mother to come & visit us! materials, puppy application, and a DVD with pictures of our puppies, dogs, and lots of references. as lots of references & a puppy application. Shipping : Ships Within <?xml:namespace prefix = st1 />USA only & only within certain areas depending on distance & flight time. puppies are extremely well socialized & already crate trained as well as started leash training, noise desensitization, and lots of other training. information and a puppy application, if you have to call please leave a message. checked, as well as a health certificate & records of vaccinations, etc. we will ALWAYS take a puppy/dog back! to help you if you have questions later! The right puppy is well worth the wait!!!! 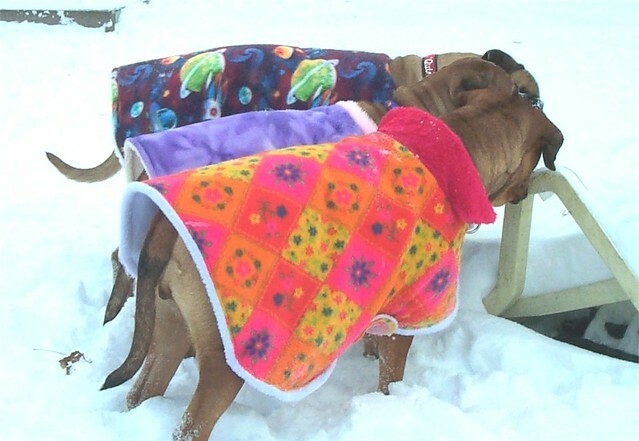 Our dogs & puppies have big blocky 'bully' conformations. 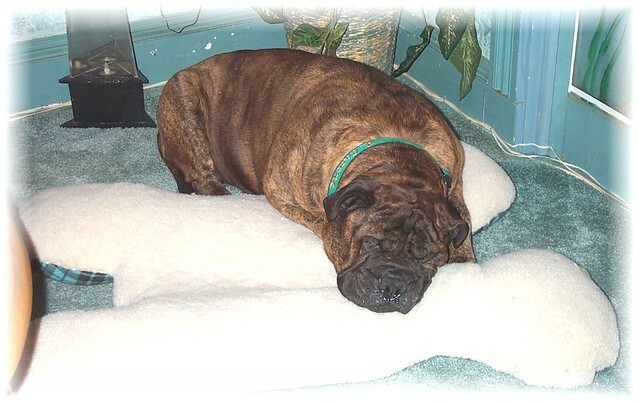 Our dogs love people, they adore children & do very well with other pets, we place our puppies in only loving homes were they will continue to be cared for with love and attention by those who understand the Bullmastiff breed well. (we are more than happy to help educate anyone interested in this breed by answering questions (as many as you want), recommending reference materials, etc.) People who want a family member, not just a show dog. Our pups are highly sought after as show dogs & we will sell puppies for show but they must be family dogs first. We do not sell puppies with co-ownerships, if you buy one of our puppies, that puppy is yours only! We also do not require you name your puppy after our kennel name, the name you choose is entirely up to you, the only "strings" attached are we ask, beg, plead, that you keep in touch from time to time, send pictures & updates, I get very attached to my babies & I am a basket case after they leave, I breed to share the happiness, total love & devotion these dogs have brought to my life with others so I live to get pictures & here updates about the puppies no matter how old they get, and you can NEVER bother me with questions, I am available to answer questions almost 24/7 so please don't hesitate to email me, I'm NOT one of those breeders who forgets you exist after the puppy has been sold! 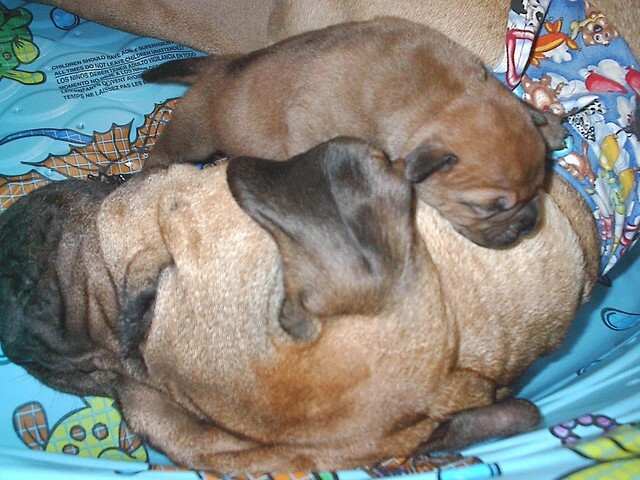 Proven studs & beautiful Bullmastiff puppies. We never breed a female before 2 years of age & we do all health screening imaginable prior to breeding, hips, elbows, eyes, heart, complete blood chemistry profile, thyroid, etc. We only breed dogs that have no genetic diseases or illnesses & a very long life span going back at least five generations, we do NOT in-breed (meaning breeding close relatives as a lot of breeders do, they will even breed brother & sister or mother & son, in-breeding just doesnï¿½t work genetically no more than it would with a human! ), we breed only the best examples of the breed according to AKC breed standards and only dogs with outstanding temperaments & intelligence. The pups have a very early foundation for learning & have already had a lot of basic training with positive reinforcement methods prior to going to their new homes, including being crate trained, used to collars, etc. We understand the importance of early socialization & the pups have had extensive socialization prior to going to their homes, they are happy, very friendly, very confident & highly intelligent puppies that adjust to new setting in minuets. If you would like us to send a puppy application please email us at: veztpets@roadrunner.com or leave a phone message with your email/mailing address. Thank you for your interest in our puppies! 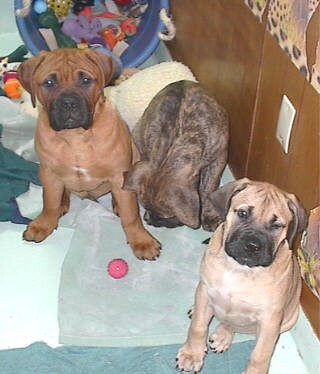 If anyone interested in buying a Bullmastiff puppy would like help in this process we are more than happy to answer questions regarding the best way to look for a nice healthy puppy that will fit well into your family & life style, we have a great list of questions to ask a breeder before buying a puppy (these are a must!) that I can email to anyone interested, it describes all the kinds of breeders & has very important questions on it. 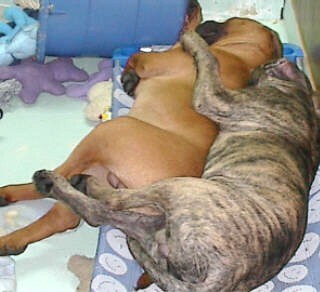 Also be careful getting breeders names off of Bullmastiff Clubs or Assoc. 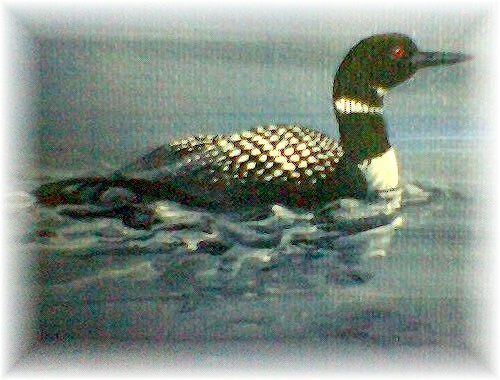 sites, most of these sites only require a fee to be listed, they do not have to pass ANY requirements, or codes of ethics in their breeding , or abide by a set of standards in regards to breeding in order to be listed on these sites. So just be careful, you want a healthy puppy that lives to a ripe old age without having to take them to the vets constantly with a host of health problems, it is tempting to jump into this but it defiantly pays to wait until you feel completely comfortable with the breeder you decide on & you want to make sure that breeder will be there for you, you will have lots of questions as you go along & especially if your a first time bully owner you want to know there is support for you through your breeder for the life of your new puppy.